If you have been around here a while, you remember the link above for the Billy Pierce Project. If you have been here recently, you know that Pat from Hot Corner Cards completed that project. Pat wondered what would be the next project. Years ago, before the blog, when I first started appreciating vintage, I started to work on a '59 White Sox team set. This was pre 2005 when we captured the Series. Also, around that time, at the flea market (a crappy one compared to what Fuji gets to shop at) I found an old Wilson ad of Fox and Aparicio, which has hung on my wall for years. Well, one of them would be the pick, and since I was a 2nd baseman when I played ball as a teen, I will start with Jacob Nelson 'Nellie' Fox. 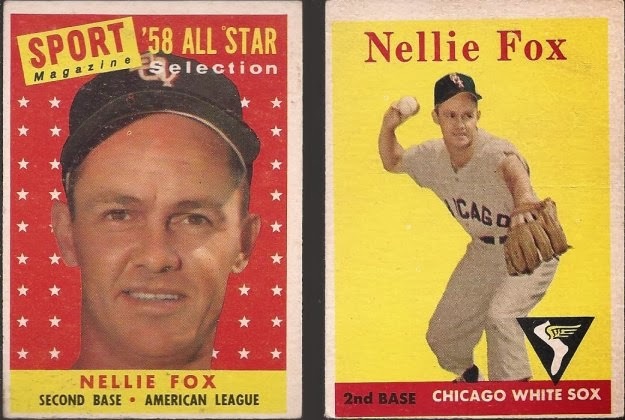 This project should be slightly bigger than the Pierce Project, but interestingly enough, Fox's first general release didn't come until a '54 Bowman (which I plan to pick up this Sunday should my bargin box guy be there). 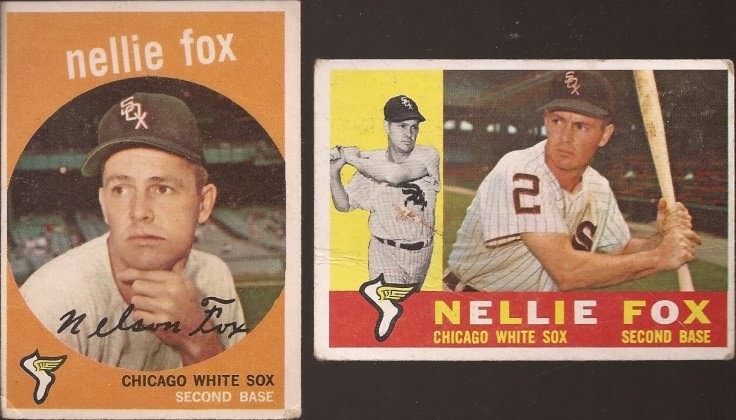 Currently, I have four cards of Nellie. The '59 came from Ebay many moons ago. I forget where I got the '60. May have been a card show. Or one of you guys. The '58 All Star was a nice gift from Jim at GCRL while the base '58 came from Adam at ARPSmith's Sportscards. So here we are. Four down - 24 to go (25 if you count the white whale). Trades are always welcome. If you and four others team up to complete this project, will you be the Fox Force Five? And if so, what's your opinion on jokes about tomatoes? Good luck, those look great! The '60 Fox came from me.